Pain au Chocolat with Frozen Bread Dough. This recipe is more fun if you have a pastry mat and a rolling pin. Make the butter rectangle first. Put butter chunks in a gallon size zipper freezer bag. Sprinkle butter with 2 teaspoons flour and shake bag to coat. Pound butter into a rectangle about 5 1/2 inches by 11 inches (it should take up half the bag), using your hands to shape it through the bag. Lay it flat and refrigerate for about 20 minutes or until it is firm enough to handle. On a lightly floured surface, roll the dough into a long rectangle, about 5 ½ x 16 inches, with the short side closest to you. If using a pastry mat, you may want to position it lengthwise. Take the bag of butter from the refrigerator. Open the bag and cut away the sides of the bag (or cut one side and the bottom) and pull the bag away from the butter so that you have a big greasy plastic sheet with a rectangle of butter stuck to it Cut the butter into pieces. Hang onto your greasy cut bag because it will come in handy later. Set one of the butter sections in the center of the rectangle and fold the top exposed portion of the rectangle down over the butter. Set the second section of butter on top of the folded down dough. Cut off the bottom exposed part of the rectangle and set it on top so you have a sandwich of two layers of butter and three of dough. Pinch the edges of dough in to seal in the butter making sure it’s fully enclosed. Put the dough in the refrigerator and chill for 20 minutes. I like to wrap it loosely on the greasy bag, put it all on my cake lifter and transfer it to the refrigerator. First Turn: Take the dough out of the refrigerator and put it on the lightly floured work surface. Roll into a long rectangle approximately 6x16 inch making sure the butter spreads out as you roll. Fold one-third of the dough down and then fold the other third up so that you have kind of a bricklike thing. Put the dough back into the plastic bag and chill for another 20 minutes. Second Turn: Repeat what you did before. Take the brick thing out of the refrigerator, roll it again into a rectangular shape. Shoot for 16 inches in length (top to bottom) and a width of at least 6 inches. You may get a wider width and that’s okay, but try fold top third down, fold bottom up and over and return to refrigerator for 20 minutes. Third Turn: Repeat the fold as you did in the first and second turns, rolling into a rectangularish thing that is about 16 inches and however wide it happens to get. Chill the dough for another 20 minutes or so or until you are ready to shape the Pain au Chocolat. When you are ready to shape the Pain au Chocolate, line a large rimmed (this is important because the dough may leak butter) baking sheet with parchment paper or nonstick foil. Put the dough on a lightly floured surface and pat it into as big a rectangle as you can. You can roll if you want to, but just patting should be fine. The goal is to get it into a shape that will allow you to cut 12 to 16 equal chunks. With a chef’s knife, score into 16 equal chunks. Gather all the chunks except 4 and put them in the refrigerator while you roll the first 4. Working one chunk at a time, take a chunk of dough and turn it so that the exposed layers (cut sides) are on the side. Press the chunk into a rectangular shape, then lay chocolate at the bottom. Press down and wrap the dough up and around the chocolate sealing it in the best you can to make a little bundle. Set seam side down on the baking sheet. Repeat, using all the dough. Cover loosely with greased plastic wrap or the greasy bag you used for the butter and let rise for about 45 minutes. Brush lightly with beaten egg and bake in a preheated 400 degree oven for about 20 minutes. Remove from the oven and carefully transfer the hot pastries to a wire rack. Note: There will most likely be leakage and it might look like a mess. Just get the pastries off the pan and onto a cooling rack and you'll be fine. Also, chocolate tends to leak out, especially with the smaller size pastries. To keep your pastries full of chocolate, keep some chocolate chips or chocolate chunks next to the oven. 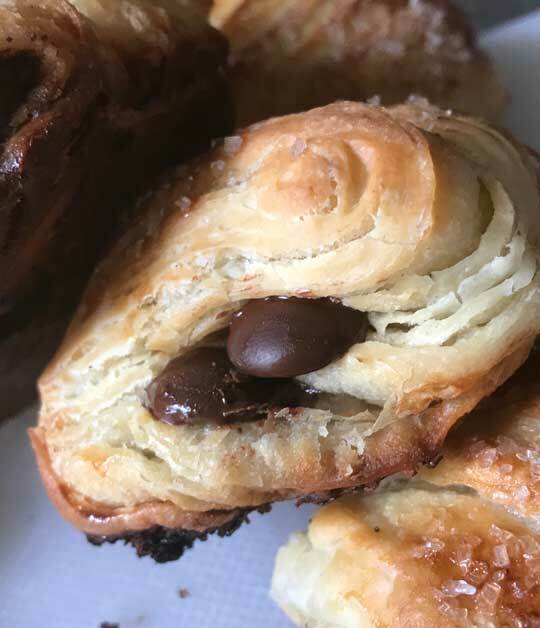 When you are removing your pastries from the baking sheet, carefully poke extra chocolate into the sides or wherever there's a nice entry point between the layers. The new chocolate will melt in with the baked chocolate as the pastries cool. These freeze well. After pastries have cooled, stick them in a freezer bag and store them in the freezer. Reheat in the toaster using your favorite method – 350 for about 5 minutes works for me.